Public library with 2 1-person-at-a-time bathrooms, one for men, one for women, both(*) with a sink and both wheelchair-accessible (or intended to - I'm not an expert or even an enlightened amateur). I think that it would be possible to fit 2 AB-only bathrooms (1 for men and 1 for women) and 1 (unisex) wheelchair-accessible bathroom within the same footprint as the layout I described, and I'm curious: which layout would likely lead to less contention? (*) Technically making an assumption there, since I checked only one, but I'm not a Fair Witness. 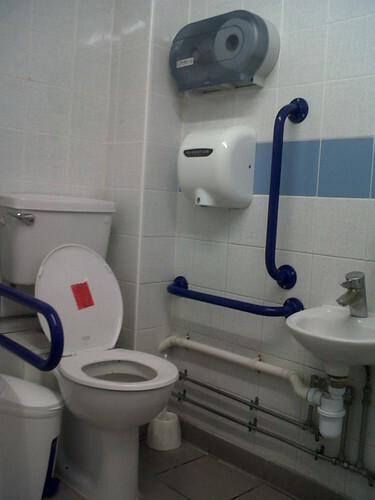 Over the weekend, I found out that our local Sainsbury's supermarket location does, indeed, have a disabled toilet. I have been going in there regularly for better than five years. A completely unmarked door, with a "RADAR Key Scheme" lock: "RADAR would like all providers of accessible toilets to keep their toilets unlocked if at all possible." So that they're, erm, accessible? How did I find out that this was a disabled toilet at all? I saw a woman in a wheelchair going in there, after leaning over precariously and uncomfortably (complete with grimace) to try to get the door unlocked. In effect, they may as well not have an "accessible" toilet at all. An unmarked door, so you have to ask if there is a toilet you can use--if you can ask. And beg a key off them to get into it, if you don't carry one around yourself. As most people needing the facilities don't, I would imagine. Additionally, I am a foreigner (American) in the UK, and had to look up what the "RADAR Key Scheme" is; the label did not scream "disabled toilet" to me. I had assumed it was a supply closet or something, which they locked up to keep customers out of the toilet paper and hand soap refills!